One of the key components of any cop-based entity is the interrogation scene. Whether comedy or drama, it's tradition for the officers in charge to interview a criminal until they eventually fess up. It goes without saying that Brooklyn Nine-Nine consistently uses this format. But, the series generally utilizes it for a cold opening or cutaway gag. It's rare for the comedy to build an episode that revolves around the interrogation. 'The Box' fixes this flaw and provides viewers with an exciting and intense bottle episode. 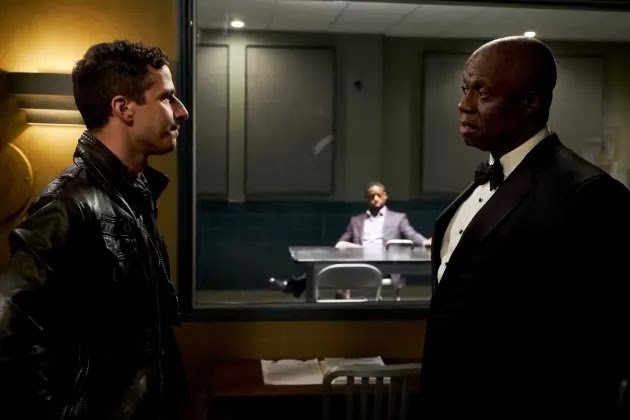 'The Box' centers on the dynamic duo of Jake Peralta and Raymond Holt attempting to squeeze out a confession from Phillip Davidson (Sterling K. Brown). As always, these two knocks it out of the park. The childish Jake and stern Holt are the comedy version of yin and yang. I admired how the writers brought a new twist to the table by having Holt become invested in the interrogation process. Usually, Peralta would be the one to bust out his crazy technics and Holt would watch from the sidelines. Here, the captain runs the show and Peralta mainly wants his approval. This is a sharp contrast from Season 1's '48 Hours'. In that interrogation-based outing, Jake played by his own rules and only made the situation worse. The differences between the two episodes beautifully emphasize the evolution in the relationship between Holt and Peralta. Throughout the seasons, the captain has become a bit more laid-back while Jake has learned to follow his orders and respect his boss and makeshift father. If their explosive chemistry wasn't enough, Sterling K. Brown pushes 'The Box' to new heights. Typically, a criminal on Brooklyn Nine-Nine is one-dimensional and easily gets caught. But, Brown's character is a witty killer who plays mind games with Peralta and takes the full episode to beat. Because this was a bottle episode, the writers managed to thoroughly develop Phillip's character and not have to interrupt with underdeveloped side plots. Brown brought his A-game with this persona and perfectly played the devious murderer role. As stated earlier, it felt nice to have a single story to focus on. It gave the writers a lot of room to create an amazing plotline and the viewers got a chance to digest the well-produced content. On top of the laughs, 'The Box' legitimately dives deep into Jake's insecurities and Davidson cruelly sheds light on what he truly thinks of Peralta's interrogation strategies. The series has previously handled Peralta's shortcomings in a joking manner, so it's refreshing and impressive that the writers crafted these scenes with a serious undertone. Since it has returned from hiatus, Brooklyn Nine-Nine has produced gem after gem. 'The Box' is a phenomenal bottle episode that balances elements of comedy and drama with grace. Sterling K. Brown plays a great criminal alongside the amazing pairing of Holt and Jake. Five seasons in, the cop comedy can still produce episodes that I would consider to be classics. That guitar scene was an amazing callback to '48 Hours'. Glad to see that Jake finally referred to one of the best cop movies of all time (Rush Hour). This episode is easily one of my top 10 favorites of all time! The only other characters to appear in the episode were Boyle and Gina. I rarely give "A+s", but this episode deserves one. What did you think of 'The Box'? What did you think of 'The Box'? Leave your thoughts in the comments below.